Last weekend I visited a ginourmous Wal-Mart in the big town of Post Falls, Idaho. There I proceeded to hunt down bags of Kraft Caramels, because where I live caramels are seasonal and have already vanished from store shelves. After squealing with excitement upon finding said caramels, I quickly snatched up five bags and headed miles away to pay. Finally arriving, and feeling like I actually exercised racing through that ridiculously large store, I spotted a box of powdered apple cider on the end cap of the checkout. It was there my brain started to wake up. That’s how these cookies were born. Created from total randomness from a crazy wife who makes cookies once a week for people she doesn’t even know. This however, does make my husband and his coworkers very happy, and so I will continue this nuttiness. These cookies are best after sitting over a warm drink for a few minutes. The caramel softens up and they turn into warm caramel apple cider heaven. Print Recipe. 1. Preheat oven to 350 degrees F (190 degrees C). Line rimless cookie sheets with parchment paper. It has to be parchment this time. 2. In a stand mixer, cream together butter, sugar, salt, and all 10 packets of apple cider mix until smooth and fluffy. Beat in eggs and vanilla extract, then mix in the baking soda and baking powder. Add the flour and mix until just combined. 3. With a standard (size 50) cookie scoop, scoop the dough scrapping off the excess as you go up the bowl. Flatten the dough slightly in your hand and place a caramel in the center. Work the dough around the caramel sealing well. Place the cookies two inches apart on the sheets. 4. Bake 12 to 14 minutes or until golden brown around the edges. After baking, carefully slide the parchment with the cookies onto the counter. Let cool until they are no longer soft but still slightly warm. Twist gently to remove, and cool the rest of the way upside down on the parchment or on a cooling rack. Notes: If cookies get too cool before you twist them off, freeze the whole sheet for a few minutes and they’ll come right off. Recipe and photograph Copyright 2009 Laura Flowers. I like the sound of apple and caramel! What a clever idea to use the cider mix in this fashion. Apple and caramel is a very popular combo and these cookies sound and look delicious. Incredibly creative and beautiful! Love them, will give this one a try. Thanks! Wow. Those look ridiculously good. I think I'm going to have to try them! They look delicious Laura! What a clever recipe. I love the way you've captured these ~ NICE job!! oooooh man, yum! drool....what more can I say? I going to make a batch of these in the very near future. providing my grocery store has caramel...oh crud...now I'm worried. please please please let them carry caramel year round. What a great story! These must be heavenly! Apple cider in cookies? Fabulous idea! I love that you added caramel too. I'll have to try these! wow! i am impressed. those cookies sound really good! Honest to God, this is one of my regular go-to blogs to read! Great writing and awesomely inspiring photos! I can smell them baking!!! I'm impressed you know about numbered cookie scoops :). I have more than I care to admit to, but they're great for all kinds of kitchen tasks. So tell us, how many of those caramels did you eat before they made it into the cookies? These do look terrific. I find it amusing that the recipe makes 51 cookies. Thanks for commenting. I really loved reading them. And Patricia I only ate about a half dozen caramels. The baking tax. I was excited when you added the photo and I'm pumped about these now. These babies do not disappoint. And love your photo composition, as always. the second pic is gorgeous! Holy smokes these look delicious!! Wow, am I glad I found this blog!!! Beautiful! This is quite a unique cookie for me, will try it for sure!!! Interesting. I've never seen apple cider cookies. They look yummy! oh mamma mia che buoni!! Matraiea thank-you. I've thought about making caramels and this would be a perfect cookie to try them with! I am so glad I chanced upon your blog Laura :) Thanks for stopping by mine! I opened your page and immediately started drooling! How delicious, I tried to find kraft caramels here in So. California and can not find them. Weird huh?! OH. MY. GOSH. I think I am now going to consider you among the other cooking geniuses I adore. Seriously! This idea is out of this world! I'll be trying this genius recipe for sure! okay so i saw the name of these cookies and got pretty excited. why? because i've got apples. I've got tons of apples. I've made apple slaw, apple sauce, apple muffins, apple cider, apple cider donuts, apple cake, baked apples. I've put apples in salad, cooked em up with pork chops, and served em sliced with cheese. so... my question is... how to adjust this recipe to use actual apple cider? I am sure I'd reduce it ... but then how to corporate without getting the batter too sticky? any advice would be much welcomed! I tried to problem solve the same thing with apple cider. What I came up with is that I couldn't get enough apple cider flavor into the cookies without putting too much liquid in. I ended up using it for cake instead. I'm so sorry I couldn't be of more help. I've made apple cider syrup before. Take about 1/2 gallon of cider, add a cup of sugar, and then reduce, reduce, reduce until you have about 2 cups of syrup. That might work for the cookies. It would take some scientific adventuring though to get the liquid/dry balance correct. Ben you arrived at the strangest time. I was just wondering this morning if a sweet reduction of cider could be done enough to retain the flavor and use in cookies. I'm a complete sucker for apple and caramel together, and to have the combo in a cookie is a dream - these are wonderful, Laura! By accident I spilled some cinnamon sugar on them, so tried rolling the rest in the mixture...turned out even better! Debbie that is so cool! Thanks for the great recipe. I needed something new for my cookie exchange... this will be it! Oh my goodness, these sound amazing! I just noticed this recipe. They look so good, like something straight out of a book. *not sugar free* - exactly. I really hate sugar free stuff! I like that you're championing the cause. Also, I think cider is something different in the States. Here, it's alcoholic. Like beer. I am serious. Can you get that kind of cider? Laura, you've probably already noticed but this recipe was featured on The Kitchn. Congrats! 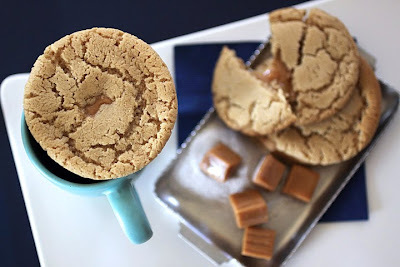 Wow, this is a fantastic recipe- the apple cider and the gooey caramel center--well, that is just pure cookie bliss!! Bookmarking as I type! Ran out to get the ingredients and baked this recipe within 24 hours of finding it on your blog. Yes, I was that excited about this cookie recipe. The results were scrumptious! Crunchy, chewy, sweet and tart all in one.The first 2 dozen disappeared while still warm.The third was rolled in chopped nuts. (They were yummy too.) The last dozen balls were frozen unbaked. ahh to bake yet another day! Wow! I am so glad. Thank-you for sharing with me. Too excited to try these, so I attempted to make the apple cider syrup. It wound up thin, and I held it out until the end, after I added the flour. I poured the warm syrup into the batter until it had a cookie dough texture-but it didn't have enough flavor. I poured a little more, but it was hot, so it started to really melt the butter, and it looked just like a muffin batter. I continued to add more until I got the consistency and flavor I was after, then baked it up at 375 in mini muffin tins and popped the caramel into the center of each one! They were delicious(although the caramel did sink and stick to the bottom. Not a showpiece, but a yummy afternoon snack anyhow. I'm going to try to let them cool some more and then remove them from the liners. Maybe the next batch will be in big muffin tins. Oh you tried it! I was wondering how it would go with a reduction of cider. It sounds like it was difficult to get enough flavor in without making the dough too moist. I think your muffin idea is brillant, and I'd love to hear how they turn out. I just made these. Oh my goodness. They are soooooo amazing delicious! thank you! I tried these out for myself. So delicious. Thanks for sharing the recipe! I brought a batch of these to my family's Thanksgiving dinner and they were a hit! Thanks so much for sharing. Holy cow! I finally got a chance to make these and I just KNEW they were going to be my new favorite cookie, seen as how my favorite Halloween candy is those caramel covered apple lollipops! Thank you so much for the recipe, these are going to be a hit at the cookie exchange on Sunday! These look great! I'm thinking of making them for my cookie swap...Can anyone tell me about how much apple cider mix they used?(eg. how many grams). 10 packets sounds like a lot! I have some packets at home, but I'm not sure how the amount in each packet compares to the brand that was used in this recipe. Thanks! Thank-you Susan! I am so glad you liked them. ~Gen, don't worry about the amount. Just put in dried apple cider until you can smell it quite strongly. The recipe is pretty flexable. I just made these and they are fabulous! My cookies look exactly like yours (although your pictures are better!) Delicious! I made these last night but I used the caramel chips that didn't work so well. They were also way to salty I think it should only call for 1/4 Tsp of salt and not a whole Tsp. so I will be going to the store for regular caramel squares and more apple cider mix so I can retry making these. Sorry they were too salty. The extra salt was to balance the sweet of the caramels, but of course it could be cut down. I made these with my younger brother.. too much fun, plus the cookies were delicious! We cut the caramels in half and they came out beautifully. My lab loved them. i don't have a cookie scoop. is there an equivalent? 1 scant tablespoon is about the size of a size 50 standard cookie scoop. 2 teaspoons make the size of a size 60 mini cookie scoop. I just made these and they are VERY good... I never would have thought to use apple cider mix this way. Thanks!! I saved this recipe last year, with full intention to make them right away, but I kept forgetting to buy the cider. I remembered it on my last trip to the grocery, and boy am I glad. These cookies are fabulous. REALLY fabulous! What a brilliant idea to use the cider mix. :) Thanks so much! I totally lovee these cookies, and found my way here thru http://scrambledhenfruit.blogspot.com/2010/11/caramel-stuffed-apple-cider-cookies.html. ANd i loveeee a crispppp cookies!! Have orderd for the caramels and so waiting for them! Now for the apple cider, u think any thing else will work, i mean any apple drink powder? I assume any apple powdered drink will work, but you'll have to try to know for sure. If you do let me know please! These are the most AMAZING cookies I have EVER had. I looooooved every moment of them. I just posted about them on my blog, thank you so much for posting!!!! YUM, YUM, YUM. That's all I can say. I made these yesterday and I cannot stop eating them! Perfect fall snack! THANKS! I linked back to your recipe on my blog...these were divine! I thought for sure I would mess this recipe up somehow, but they turned out amazing. Thanks for sharing! I used a half caramel per cookie in this batch. This will be my new holiday go-to recipe. How are these the next day versus the same day? I don't like cookies that are too crisp and am wondering if they get too crisp the next day? 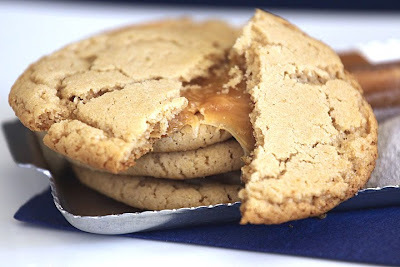 I have a question that may be silly but after stuffing the dough with a caramel and sealing the edges, do you need to flatten the cookie or will the cooking process give the cookie it's flat shape as pictured? You don't have to flatten the cookie. It will just melt on it's own. I'm afraid I don't know that answer. I've given away every batch I've made of these. These are amazing! I have eaten a ton of these in the last several days. I've kept them in a large Tupperware container and they've stayed nice and soft. I'm going to link to this on my blog. mmmm... I just made these tonight for a bake sale and they were so yummy! I also made a separate batch using 7.4 oz of pumpkin spice drink mix instead of the apple cider mix, and they turned out wonderfully delicious as well! Thanks for the recipe/awesome idea! What do you mean by parchment? Like wax paper or what? You can usually find it at the grocery store or most Wal-Marts. Hi, I live in England and I can't find any powdered spiced cider mix anywhere, is there anything you can suggest as an alternative? Wonderful recipe and gorgeous photographs. My question is could I use a Sugar Cookie Pouch mix and mix the Cider into that? What do you think? I'm really sorry but I don't know of any other product that would work. Someone tried liquid apple cider last year and it didn't work. I hope you find something.